The Grade Crossing Signal at SBHRS is a functional signal. 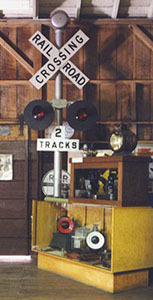 This enables visitors to see and hear an operating Grade Crossing Signal. This style of Grade Crossing Signal is still very common across the country, especially on less-used roads. Roads that have more traffic typically have a crossing gate arm added to the configuration shown here.